Messenger RNA (mRNA) has long been thought of as the middleman in the central dogma of molecular biology (DNA makes RNA and then RNA makes protein), which shuttles genetic information from DNA in the nucleus into the cytoplasm for translation into protein. Now, however, researchers at The Rockefeller University have uncovered some unusual expression patterns for components of mRNA molecules. In the new study, the investigators describe widespread disparities in the expression of various mRNA coding and noncoding regions—a scenario most assumed does not normally occur. A typical mRNA molecule contains a protein-coding sequence (CDS) that is flanked by two noncoding regions—3′ and 5′ untranslated regions (UTRs). The UTRs have been found to be involved in regulating gene expression, as many have binding sites for regulatory proteins and microRNA’s. It has long been assumed by scientists that the CDS and UTRs move together as a single mRNA molecule. 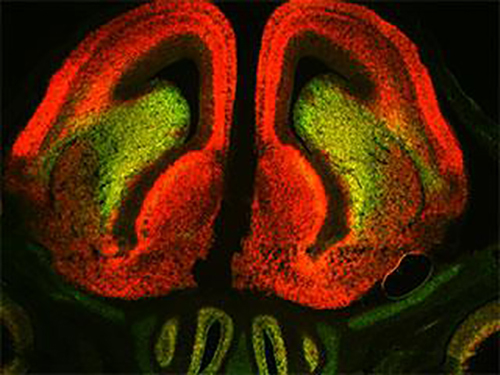 Using a technique called translating ribosome affinity purification (TRAP), the researchers isolated purified mRNA from dopamine neurons of embryonic mice. When they viewed the expression patterns for the isolated mRNA, to their surprise they observed that some genes in dopamine neurons showed abundant expression of 3′ UTR mRNA sequences and little to no expression of the CDS for these mRNAs. For example, two genes in the Sox family, Sox11, and Sox12, which are known to help determine the fate of cells during development, followed this unusual expression pattern. This contradicts the common thinking that once an mRNA is transcribed from a gene, the 5′ and 3′ UTRs and the CDS act as a unit until protein is produced and the mRNA is degraded. In order to verify their findings and observe if this phenomenon was restricted to dopamine neurons, development, or the nervous system, the team used green probes to mark coding sequences and red to mark the 3' UTRs of 19 genes in embryonic and adult tissue. The Rockefeller researchers went on to show that this pattern was true for every gene they examined and that differential expression of UTR and coding sequences occurs in the embryo, in the adult, and outside of the nervous system. Even widely expressed genes such as β-actin, a structural protein essential for cell movement, showed differences in UTR and CDS expression. Interestingly, when the researchers focused specifically on developing dopamine neurons, they found that many of the genes with high UTR-to-CDS ratios turned out to play roles specifically in development while the genes with comparable ratios were more often involved in generic cellular processes.